Hey everyone. I decided to tackle the drive home from Tampa immediately after completing my newspaper responsibilities last night. Sorry for the lack of post-game blogs. I just had to get home. Being on the road that long drives me crazy. I thought about this on the drive home -- that was the best game I ever witnessed first-hand. I've always told people that the 1999 Super Regional baseball game between Auburn and FSU, the one where the late Brent Schoening used 130+ pitches to hold down a much better team, was the best athletic event of my lifetime. I decided to reclassify that as "best individual performance" of my lifetime. You should have been there. Yesterday's game was incredible. Four end-of-game celebrations, only one of them truly meaningful. Ben Tate losing his head and nearly losing the game. An illegal batting penalty on a guy who was in pass coverage 25 yards from the infraction. Crescendo after crescendo. And then a "modern-day fumblerooski" that was squashed at the 2. Numbers that stood out -- and will stand out forever. **Josh Bynes, Craig Stevens, Neiko Thorpe and Daren Bates played all 115. **Do you know how crazy that is? I'd assess 80 snaps as "crazy." **Mike Kafka threw 78 passes. **T'Sharvan Bell (known everywhere as Tee Bell) picks two passes. **Walt McFadden takes one 100 yards. **Northwestern, for all that offense, goes 6-for-23 on third down. **Auburn penalized 12 times for 140 yards. Holy cow. **Northwestern earned 33 first downs to Auburn's 18. **Auburn finished with 425 yards on 72 plays. You're thinking: "Nice work." **Northwestern finished with 625 yards on 115 pays. "Seriously?" **Northwestern rushed 37 times for 93 yards. That's a 2.5 average. Nothing. **Thorpe finished with 13 solo tackles. **Auburn had 22 possessions. Northwestern had 18. **Eighteen Outback Bowl records were broken Friday. Ten were tied. ALSO OF NOTE: I enjoyed seeing everyone in the Official HABOTN Section®. That group included THT, LGG Byron, THT 2.0, Digger, IV, IV's sons, mrtommyd, AuFan365. I think Sean was due in the section, but I had to leave before he arrived. Thanks for the placards, THTs -- that was awesome. ps: Is Cody Parkey struggling in the Under Armour game or what? Two missed PATs (one was affected by a bobbled snap), a short field goal and his kickoffs have been fielded at the 25 or so. Yummy! Hi. It's time for the second half. Auburn first possession: INTERCEPTION. Kodi Burns was picked on an outstanding play from a NU defensive back. Northwesterm first possession: PUNT. Not much going on. Auburn second possession: PUNT. Not much going on. Northwestern second possession: INTERCEPTION. Neiko Thorpe got this one. That's four now. Auburn third possession: PUNT. Not much going on. Northwestern third possession: Brewer 36 pass from Kafka. Demos PAT kick good. Drive covered 80 yards in 7 plays. Auburn fourth possession: PUNT. Three and out. Yuck. Northwestern fourth possession: TOUCHDOWN. Drake Dunnsmore 67 pass from Kafka. Demos PAT kick good. Drive covers 67 yards in 1 play. Dunnsmore broke tackles against Demond Washington and Walt McFadden. It was bad. Auburn fifth possession: PUNT. Not much going on. Northwestern fifth possession: INTERCEPTION. T'Sharvan Bell did it again. That's five picks for Auburn. Auburn sixth possession: TOUCHDOWN. Ben Tate 5 run. Byrum PAT kick was good. Drive covers 60 yards in 7 plays. Darvin Adams caught five passes on that drive. **I have to go downstairs for interviews. ** I can't update this. Hey everyone. 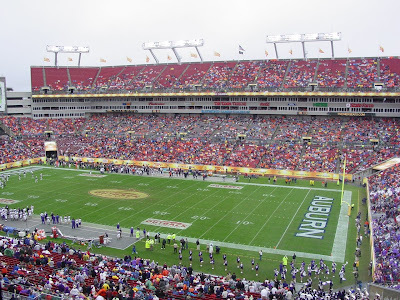 We are watching Auburn's game against Northwestern in the Outback Bowl this afternoon. Please join in. The game can be seen on ESPN. Northwestern has won the toss. Northwestern first possession: INTERCEPTION. Walt McFadden got it. Auburn first possession: TOUCHDOWN. Kodi Burns 1 run. Wes Byrum PAT kick is good. Drive covers 31 yards in five plays. Ben Tate broke off a 24-yard run to get the Tigers to the 1. AUBURN TOUCHDOWN. Walt McFadden returns an interception yards for a touchdown. Northwestern third possession: TOUCHDOWN. Andrew Brewer 39 pass from Mike Kafka. PAT kick was good. Drive covered 67 yards in 6 plays. Auburn second possession: PUNT. Three and out. Live to punt. Northwestern fourth possession: MISSED FG. Auburn third possession: TURNOVER ON DOWNS. Auburn's fourth-down pass was ruled incomplete. Northwestern fifth possession: PUNT. Not much going on. Auburn fourth possession: TOUCHDOWN. Quindarius Carr 46 pass from Todd. Byrum PAT kick good. Drive covers 79 yards in 5 plays. The touchdown was a trick play -- a pump fake on an alleged screen let Carr slide into single coverage. He just beat dude. Northwestern sixth possession: PUNT. Three and out. Auburn fifth possession: PUNT. Auburn crossed mid-field, but couldn't dig deeper. Northwestern seventh possession: PUNT. A bad punt, too. High snap. A 19-yard effort. Auburn sixth possession: INTERCEPTION. Kodi Burns tried to hit Mario Fannin for a big gain, but a Northwestern defender made a really nice play on a lofty pass. Northwestern eighth possession: INTERCEPTION. T'Sharvan Bell picks a pass in the end zone. That's a reversal of fortune because Tee Bell's mistake allowed Northwestern's first touchdown. 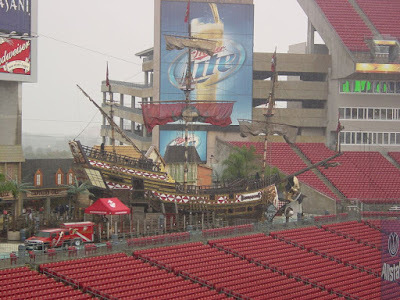 I just returned from a visit to the official HABOTN Section® of Raymond James Stadium. THT and his proteges, LGG Byron and 2.0, created placards to promote our fine site here. Perhaps they'll get some face time on ESPN's broadcast. Welcome to "Football In Paradise"
Hey everyone. 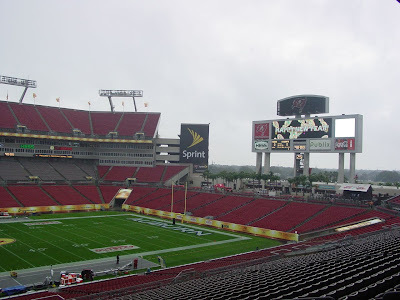 So it's very wet now in Tampa. The rain is everywhere. I don't have a future in meteorology. Here are a few more things I saw on my journey through the mezzanine. As if I'd subject myself to rain! And the compulsory shot of the pirate ship. Thanks for being here today. We appreciate you. Hey everyone. 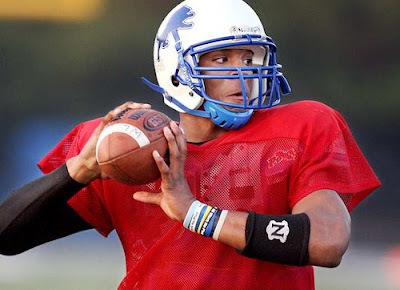 The recruiting czars -- AuburnUndercover.com, AuburnSports.com and Inside The Auburn Tigers -- are reporting that quarterback Cameron Newton has committed to play with the Tigers beginning next week. He is, according to Rivals.com, the nation's No. 1 junior-college prospect. Newton chose Auburn over Mississippi State and Oklahoma. He signed with Florida in 2007 out of an Atlanta high school. He was arrested in November 2008 for grand theft and larceny for allegedly stealing a student's laptop computer. Urban Meyer suspended Newton and the quarterback soon landed at Blinn (Texas) College, which recently won the junior college national championship. In a telling demonstration of what former Florida staffers thought of him, head coaches Dan Mullen (Mississippi State) and Charlie Strong (Louisville) have pursued him during the past few months. Both coaches were UF assistants during Newton's days in Gainesville. The Florida State Attorney's Office recently dropped the charges after Newton successfully completed a pre-trial intervention program. Newton stands 6-foot-6 and weighs 235 pounds. He was an option quarterback in high school and is considered an advanced runner. He threw for 2,800 yards at Blinn last season, though observers said his mechanics will need significant refinement. Thanks to Todd Van Emst, Auburn's ace photographer, for providing irrefutable evidence of assistant coach Jay Boulware's work with special teams. Hey everyone. Here's a more general look at the game -- including my prediction. 1. Few believed Auburn would qualify for a meaningful bowl after losing its final two regular-season games. Circumstance (six Southeastern Conference teams finished with 7-5 records) and some good salesmanship from athletic director Jay Jacobs helped the Tigers seize an important opportunity. Coach Gene Chizik now has guided what appeared to be a struggling program into a New Year's Day bowl, which has to be considered a successful first season. Auburn administrators played a major role, but Gus Malzahn's offense and the players running it gave the Tigers an engaging, distinguishing characteristic. 2. Onterio McCalebb's first college season changed for good in September when he injured his left ankle during a fake punt. He spent the next two months trying to run without pain. It didn't happen. Without McCalebb, one of the team's fastest players, the running game dipped from epic to strong. Six weeks of treatment and relatively light training have given McCalebb confidence that his troublesome ankle no longer is an issue. If he's fully healthy in Tampa, Northwestern could be in for a long afternoon. 3. Ted Roof saved his best for last, devising a brilliant defensive scheme to slow Alabama's rushing attack. A dedication toward controlling gaps undermined the Crimson Tide's zone-blocking tricks and provided clear affirmation that Roof knows what he's doing. Was that a one-time deal? Roof will have Eltoro Freeman back on the strong side and his remaining starters, fatigued to the max after working 60 or more snaps per week during the fall, are as rested as ever. Auburn's defense wasn't very good this year. A strong defensive performance in Tampa should prompt fans to knock their 2010 expectations up a notch. 4. Chizik wasn't exactly a popular choice when named head coach last December. Yet the Tigers beat expectations by winning seven games and now have a chance to win eight. Players seem revitalized. Recruiting has gone well. Fans have been pleasantly surprised by the team's renaissance. Bowl games typically are considered hyped exhibitions, but Auburn isn't taking this one lightly. A program that markets itself as an up-and-comer needs to demonstrate that guile in Tampa. If the Tigers beat Northwestern, analysts across the nation will begin picking Auburn as an SEC contender this summer. Not bad for a coach who went 5-19 at Iowa State, no? Coleman's season was bisected by a wrist injury that cut his production during October. He rebounded furiously in November and emerged as an NFL-caliber playmaker. That wasn't enough. Coleman, now six weeks after the cast was removed from his right wrist, is ready to prove his worthiness. It's almost money time. He'll be going against Netter, an accomplished tackle, in many of the difficult situations today. Netter is a sophomore who started all 12 games this season and showed consistency throughout. He's used to tough assignments. Still, Coleman may be the most difficult challenge of the season. If Netter isn't able to keep pace with Coleman's speed rush, quarterback Mike Kafka and the Wildcats' passing game will suffer. Northwestern desperately needs its passing game to function well today. Freeman's first year with the Tigers has been a disappointment. He struggled to earn playing time out of fall camp. Once he cracked the starting lineup, he was productive just long enough to feel comfortable before suffering an injury against Georgia. Freeman didn't play against Alabama. When healthy and focused, Freeman is a run-stopping terror. He's fearless. He hits with authority. He has enough talent to undermine Northwestern's run-game plans. Freeman so badly wants to be an every-down contributor and, to this point, he hasn't been that guy. Today could give fans -- and the linebacker himself -- a taste of what is to come during the next two years. 5.0 -- Yards per carry for Auburn this season, its highest average since 1986. 323 -- Points allowed by Auburn this season, the most in school history. You know Auburn is a difficult team to predict. This group will play really well at times. Then it'll unravel. The degree of that unraveling determines Auburn's end-of-the-day fate and, honestly, that's a difficult thing to assess ahead of time. The Tigers look good to me. I sense a thirst for postseason excellence that hasn't existed at Auburn since the 2005 Sugar Bowl. This offense has certified its authenticity time and again. We all know Auburn will score. The question is if Auburn can stop the other team from scoring. Northwestern has a good team, but its strength is defense. The running game simply isn't there and Auburn loves hearing that. You know why. Hey everyone. I will be participating in my weekly segment on SuperSport 930 out of Jackson, Miss., in a bit. That extravaganza will begin around 9:30 a.m. CST. We will discuss Auburn, Northwestern, Brittany Murphy, casinos, Tiger Woods, Tampa traffic, Dothan traffic, other similarly pertinent stuff. Hey everyone. Been a busy day here at HABOTN's Tampa headquarters, where we're writing to fill up the Thursday and Friday sections of the Advertiser. They'll be chock full'o goodies for you all. You want a sample? I knew you did. Gene Chizik promised an offense that was built to run and he didn't falter, watching his team average 214 rushing yards per game. The figurehead is tailback Ben Tate, who emerged as one of the Southeastern Conference's top players with a best-case scenario season. He enjoyed good health, consistent blocking and finished with 1,254 yards. Not bad. Onterio McCalebb provides an ideal complement when healthy. He was troubled during the final third of the season with a chronic ankle problem, but coaches believe six additional weeks of treatment will give McCalebb the ability to cut inside while moving to his left for the first time in three months. Northwestern isn't poor against the run by any means. Surviving in the Big 10 Conference requires toughness up front and the Wildcats have plenty with linebackers Quentin Davie and Nate Williams. They conceded 212 yards to Illinois in mid-November, which was alarming, but held run-prone Wisconsin to a season-low 99 yards a week later. Still, this is where Auburn thrives. It should continue that trend in Tampa. Is that right? Auburn gets a defensive advantage? The truth is that fatigue messed with the Tigers' defense more than anything. A thin depth chart was taxed when starters were asked to play at least 60 snaps every week. That left defensive coordinator Ted Roof looking for ways to fix an unfixable problem. Auburn's defense played well against Alabama, providing a clear affirmation that Roof has the ability to scheme opponents. Now he has a defense that is healthy and rested for the first time since early September. The Wildcats are committed to offensive balance, but that doesn't mean it’s a healthy thing. Quarterback Mike Kafka earns more carries than anyone on his team. While he's a fine runner for a quarterback, he's not a big-play threat. Northwestern doesn't have any. Coach Pat Fitzgerald rotates several tailbacks into featured roles, but none have distinguished themselves. The team averages 3.1 yards per rush. Chris Todd has enjoyed a fine senior season. He's made plenty of good decisions and, in the end, has been at least a serviceable option for offensive coordinator Gus Malzahn. He is not a game-breaking element. In fact, it's now obvious how serious Malzahn is about featuring the run. Auburn dedicated 61 percent of its plays toward the ground game this season. That's not necessarily a knock on Todd -- he finished with 21 touchdown passes, after all -- but passing is a surprisingly peripheral part of the Tigers' offensive personality. Northwestern has the pieces to undermine Todd. Four players have at least a pair of picks this season -- Walt McFadden is Auburn's only multi-interception player -- and the pass rush is at least ample. Defensive end Corey Wootten, who struggled with knee and ankle injuries for most of the season, is expected to be fully healthy in Tampa. He was an outstanding rusher throughout the 2008 season and knows this game provides an opportunity to silence doubters. Northwestern conceded yards during the regular season, but some of that was due to Fitzgerald's willingness to take chances. Will that be enough to confuse Todd? My guess is yes. Mike Kafka is a very good quarterback. He isn't remarkably powerful. He's not particularly fast. What makes Kafka so valuable is that he brings life to the Wildcats' offense. The senior understands Northwestern's short-pass system and makes it work without many snags. He's accurate. He doesn't make many mistakes. Kafka also has enough guile to add another dimension to the team's rushing attack. He finished the season with 465 rushing yards, but yardage lost due to sacks -- he was hit behind the line 25 times this season -- dramatically diminished Kafka's overall numbers. Still, that duality affects opposing defenses. Simply put, Kafka is a threat to do anything at any moment. Auburn pass defense isn't remarkable. McFadden provides good coverage at cornerback, but the Tigers are inexperienced at safety. The team's other cornerback, Neiko Thorpe, was bust-prone in October and November. If Antonio Coleman and Antoine Carter can generate pressure along the edge, Kafka could be marginalized. That has happened more often that expected; Northwestern has allowed 29 sacks this season. Auburn's work on special teams hasn't exactly been memorable, but there have been bright spots. Kicker Wes Byrum doesn't get the recognition he deserves for hitting 14 of his 15 attempts this season. His only miss was a 46-yarder at Tennessee. Demond Washington also looks like a find on kickoff return. His touchdown against Georgia was memorable. Who knew he had that much speed? Auburn's coverage teams are putrid. Northwestern is a little better with its coverages, but the difference is nominal. Both teams have terrible punt-return groups. It's hard to find teams that even approach Auburn's 4.5 yards per punt return, but the Wildcats clock in at 6.6. It comes down to Byrum and Northwestern's Stefan Demos, who is an average kicker and a below-average punter. Chizik has been a surprise. It's difficult to know how much influence he has on the things we all see on game day. Coaches don't talk about it. Chizik certainly doesn't talk about it. One thing is clear: Auburn's staff works together well. The offense has been much better than expected. Aside from missteps against Kentucky and LSU, things have progress. The defense is troubled, no doubt, but Roof doesn't appear to be the problem. He needs more players. Special teams have been an issue, but even that problem seems to be less critical these days. Northwestern has improved under Fitzgerald, who played linebacker for the Wildcats' 1995 Rose Bowl team. They're sound on defense and don't rely on trickery to compete despite rigorous academic standards akin to Vanderbilt. Still, Auburn has a remarkable offense. That's a big reason why the Outback Bowl selected Auburn. This offense is unique in some ways, generates plenty of yards and excitement. Both of these programs consider themselves on the upswing. Northwestern has been a bottom-half team in its league for generations, but has gained the ability to become competitive more often. Auburn bottomed out last season. Chizik and his staff have changed almost everything about the program and created an excitement that hasn't existed since 2004. Though the team's record is only two wins better than a year ago, there's a sense that the Tigers are on the cusp of bigger achievements. A win in Tampa could provide more meaningful data. Players are surprisingly eager to consolidate progress they believe was made in losses to Georgia and Alabama. They're looking at this game as a way to re-establish national credibility. Northwestern is a pretty good team in a pretty good league. Auburn believes it's better than that. The SEC has the best defenses around. NFL rosters tell the story. They're loaded with guys from this league because it produces more professional-grade defenders than any league. Auburn's offense has broken through against several SEC defenses this season. It's legitimate. Northwestern ended its season with better defensive numbers, but Auburn may be different now. A strong performance against Alabama seemed to demonstrate significant improvement and the addition of outside linebacker Eltoro Freeman, who was out with two injuries, will give the Tigers more power in Tampa. Auburn really wants this game. Its offense is most outstanding element of this game. Ben Tate is the best offensive player in this game. Antonio Coleman is the best defensive player in this game. Auburn has plenty of advantages. Now the question becomes: Can it capitalize? Hey everyone. So I'm still stuck in this hotel room. It's nice to have a view of Tampa Bay and all, but it's really just me and the computer. Still. I'll take a few minutes each afternoon (pre-Outback Bowl) to pontificate on some Auburn topic. It'll be freestyle, stream-of-consciousness stuff. Sure, he's an all-conference cornerback. Sure, he was the most reliable element of a defense that was unstable for most of the season. Sure, he used free time to groom some of the Tigers' young defensive backs and share the lessons taught to him by his predecessors. What you may not know is how valuable McFadden has been in other ways. Talking with reporters isn't easy. Questions sometimes get difficult, answers become confusing. A balance exists between what players want to say and what they should say. Identifying that balance and manipulating it comfortably turns a normal player into a ambassador. And that's exactly what McFadden became: An ambassador. The senior on Tuesday was awarded the inaugural "Good Guy Award" from writers who cover Auburn on a daily basis. After years of watching players duck interviews in the craziest ways -- Kodi Burns has nothing on David Copperfield when it comes to escaping a closed elevator -- we wanted to reward the guys who take the time to stand up when it's not easy. McFadden did it time and again. When Auburn was askew during the 2008 season, he strolled in for his weekly powwows with the same enthusiasm he exhibits these days. If stories about the Tigers' defense were out of style, McFadden adapted by discussing anyone on the team. He is a social guy. He pays attention. The comments he provided about teammates were insightful, thoughtful and often novel. All this from a guy who was a sullen mess during his first season at Auburn. He has our respect. He deserves your as well. Hey everyone. Our friends at BulldawgJunction.com, a website that covers Mississippi State, are reporting that quarterback Cam Newton has delayed his enrollment decision. The former U. Florida player was supposed to choose between Auburn, Mississippi State and Oklahoma on Dec. 31. That decision is on hold. The Tigers recently extended an offer to the quarterback, who now plays at Blinn College in central Texas. Of note: Blinn's coach is Brad Franchione, son of the former Alabama coach. Anyway, Newton's father said a decision will be announced Saturday at the earliest. Hey everyone. The suspense has ended. TAMPA -- Auburn senior cornerback Walter "Walt" McFadden has been selected as the first recipient of the "Good Guy Award," which will be presented annually by the local chapter of Auburn beat writers. The award is meant to recognize a player who is consistently congenial and professional in his interactions with the media. The East Alabama Auburn Beat Writers Association of America voted to give McFadden the inaugural award for his friendly demeanor, regular participation in media interviews and outstanding quotablity. "Walt is a reporter's best friend," said EAABWAA media relations committee chairman Evan Woodbery. "He could speak intelligently on any number of topics and his outstanding sense of humor never wavered." McFadden will be presented with a plaque from the EAABWAA at a later date. "I really do appreciate that," McFadden said when informed of the honor. "I want to thank everybody...I feel like I'm at an awards show." Other players deserving of honorable mention include quarterback Chris Todd, who was always willing to speak during good times and bad, tight end Tommy Trott, H-back Mario Fannin and linebackers Josh Bynes and Craig Stevens. McFadden, a native of Pompano Beach, Fla., has started 24 consecutive games for the Tigers and was an All-SEC second team selection. He is also a member of the SEC's community service team. "You couldn't have picked a better one," said Auburn head coach Gene Chizik. "He's a great ambassador for Auburn. He's a great person. He's a great football player. He's always the same. He never changes, so what you see is what you get. I wasn't aware of the award, but now that I am I don't think you could have picked a better one. That was a good pick." 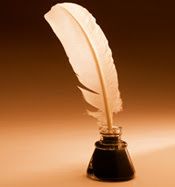 The EAABWAA is an informal professional organization devoted to advancing sports journalism. Congratulations to McFadden, who certainly was deserving. I may or may not have voted for him, but he certainly embodies what this award represents. Hey everyone. Auburn recently completed a 90-minute practice at University of Tampa. Here's what two principles had to say about the morning's events. Josh Bynes on focusing amid bowl hoopla: ``Practice is going well. Everybody is into it. A lot of guys say it's hard to focus because it's a bowl game -- all the things we've got going on. In meetings, everybody's into it. We're having a great time, but at the same time we're working hard on being a good team." Bynes on riding rollercoasters at Busch Gardens: ``I got talked into it by Mike (Goggans) and Byron Isom. There were a lot of guys scared to get on rides, but it was a lot of fun." Bynes on why Auburn's defense was better during the season's second half: ``We came with a mindset that we're going to come after the other team. We were tired of hearing everybody saying this defense isn't good. We came up with a great scheme. Our whole mentality is: Three downs. That's all we've been thinking about for the second half of the season." Gene Chizik on today's practice: ``I felt like the tempo was up. It was a little shorter today because of some of the events. We're coming down to the end of the week anyway. This was our Wednesday-ish practice for game week. Good work today. I think we're going in the right direction." Hey everyone. The East Alabama Auburn Beat Writers Association of America this year has decided to bestow an award upon the Auburn player who is "consistently congenial and professional in his interactions with the media." The Good Guy Award will be presented this afternoon. Hey everyone. So I'm stuck in this hotel room. It's nice to have a view of Tampa Bay and all, but it's really just me and the computer. It's pretty amazing that Auburn is here. 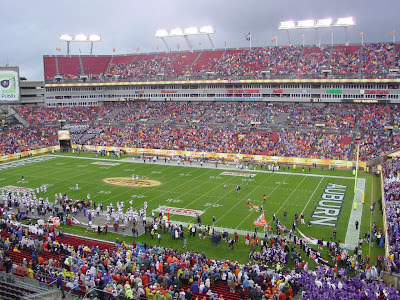 Not just because the Outback Bowl is supposed to feature an Eastern Division team. Or that the Tigers somehow found a way to become the most alluring of the Southeastern Conference's 7-5 teams. That stuff doesn't have much to do with the football team. It's chance. It's opportunity. It's administrative ingenuity. What I'll always remember about this team is its uniformity. Gene Chizik rolled into town last year talking about blueprints, plans, codes. It seemed trite. Every new coach says what he has to say. Appeasing the fans, winning the press conference, is everyone's goal. He won the press conference that day, but not because he tried. Chizik was honest. He had a plan. He coached at Auburn during its best days in 2004. He then jumped to Texas and coached there during some of that program's best days in 2005. He was at the pinnacle. Then he went to Iowa State. Things there didn't go well. We know that. Still, those struggles have given him insight that's equally valuable. Chizik was able to contrast what went well at Auburn and Texas with what failed at Iowa State. It's clear that he's a quick learner. Chizik's plan, developed while he was at Iowa State, is working well at Auburn. The Tigers are recruiting well, they're competitive despite having significant personnel shortages and they're consistent. The head coach wants to perfect the simple things first: The five-yard hitch route. Defending an inside-zone run. Communicating plays effectively from sideline to huddle. That's what the 2009 season was about: Getting the simple things correct. Expectations will grow ahead of the 2010 opener. The team should be better. It'll be interesting to see how Chizik adapts the team as experience and confidence build through the spring and summer. Auburn should become a more complicated enterprise. Managing that development will be his toughest challenge yet. Hey everyone. I have just returned from the Gene Chizik and Pat Fitzgerald (Northwestern coach) press conference. I was not able to gain access to the wireless network over there. FITZHGERALD on the weather: It's been 50 degrees warmer than is in in Chicago, so the kids are happy about that. We saw the sun today. 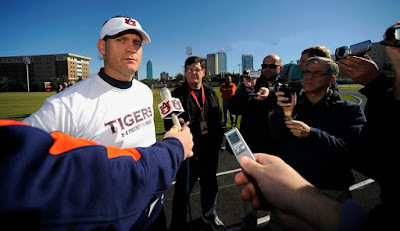 CHIZIK on today's practice: ``I thought the tempo today was much better. The focus was much better. They got the message. It was about getting our team re-focused." FITZGERALD on thriving despite rigorous academic standards: ``We've been able to attract high quality players and world class student-athletes. With that comes the expectation that we're going to do well in the classroom. You can have that balance. It all starts with recruiting. Once you have that, it's like a vacuum that pulls everyone else up. It starts and ends with the way our kids are raised in their home." CHIZIK on Derek Winter, who is from Tampa: ``He is the epitome of hard work. In the Auburn Creed, it talks about hard work. He is what the creed says. He is what Auburn believes in. He knows what his role is right now." CHIZIK on why practice was better today: ``The effort was good yesterday. It wasn’t about effort. When you have practice that doesn't go the way you want it to, it's usually focus. I addressed it after practice. Today, everybody was good. Our guys -- it's never about effort. It's about if they're locked and loaded on the task at hand." CHIZIK on Walt McFadden's career: ``He was probably immature when I got here. That's the cool thing about coaching -- you get 'em when they're 18 and they leave you at 22. You can see how much you've changed their lives. He's grown up. He's matured beyond his years. He's been absolutely phenomenal for our football team. Everybody could take a lesson from his story -- there's a bunch of 'em out there." CHIZIK on how Auburn's offense runs these days: ``It's not always fast-paced. We try to do it at the right time. Every time is not the right time for us, individually." CHIZIK on the appropriate label for Auburn's offense: ``I don't have a name for it." CHIZIK on the offense, part III: ``It was kind of an up-tempo but starting with: How are we going to run the ball? Let's run the football and see what we can do off the running game. What was attractive to me was that it was going to let us run the football but it still was up-tempo. It's different than most. We start everything from trying to run the football. Going back to being a defensive guy and having a defensive mentality, that's what I believe in. That's where my roots are." CHIZIK on his defensive philosophy: ``Don't trick yourself. Who are you? Once you know who you are, that's how you play. That's what you do. You don't guru it up every week. I know that sounds simplistic. If you get them to line up and play fast, that's what you want defensively. Don't trick yourself." CHIZIK on Onterio McCalebb: ``The cool thing about college football is that they come from everywhere. You have the rich ones, the poor ones, the white ones, the black ones. His background was tough. When he didn't make it coming out of high school, people probably told him he couldn't make it. The ones who keep doubting him are the ones who motivate him. He wants to get his degree because I'm sure everybody is telling him he can't. I'm not near as proud of any of (his football accomplishments) as I am seeing him getting his eductation. That's where he is that's light years ahead of where he was." Hey everyone. I am now settled in at HABOTN-Florida Headquarters near the Tampa airport. It's a nice place. 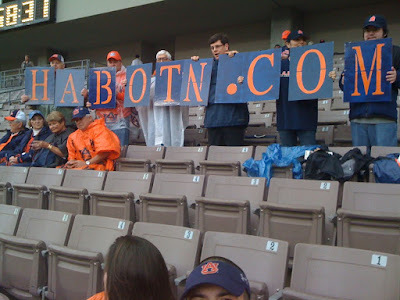 Our friends from The Gold Mine and AuburnUndercover.com are stationed nearby, so there is safety in numbers. The trip took me approximately eight hours from Montgomery. 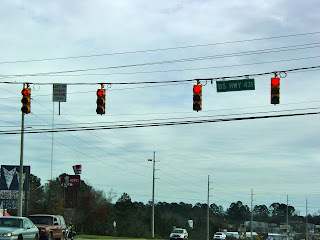 Dothan has more red lights than Amsterdam. It took me at least 30 minutes to get around that city. Second only to Crestview, Fla., in terms of unpleasant traverses. 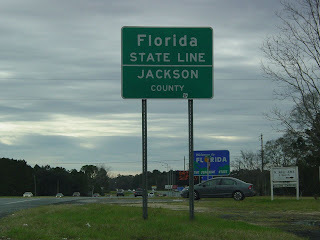 Welcome to the Florida line ... about 15 miles south of Dothan. It's never sunny when I roll into Florida. I find that odd. SCHEUDULE UPDATE: Auburn practices around 10 a.m. Monday at University of Tampa. Chizik and Northwestern coach Pat Fitzgerald will hold a joint press conference around 1 p.m.
We'll be updating as needed. Good quotes and information and insight. Talk with you again tonight.